The newest volume in Kluwer’s series of comparative analyses of Member State law and the Principles of European Contract Law (PECL), this book not only provides an introduction to German law for lawyers familiar with the PECL but also serves as a model for “reconnecting” the contract law of the European Union with that of the Member States. Although the Principles were by design distilled from the laws of the Member States, one of the arguments most frequently advanced for opposing the introduction of a EU contract law is that it would not be in line with national principles of contract law. The in-depth comparison presented here may help to refute or confirm such doubts and serve as a yardstick to measure how far EU law really has disconnected from the traditions of the Member States. 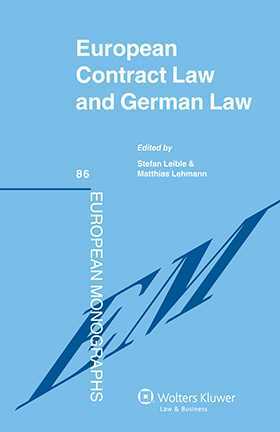 Using a straightforward comparative method, the analysis not only reveals a significant area of convergence between the PECL and German contract law, but also highlights the main differences between the two bodies of rules. The reasons for these differences, both legal and non-legal (historical, social, economic), are clearly set forth. Aspects of the relevant laws covered include the following: scope of application, general duties, terminology; offer and acceptance, liability for negotiations; effects of assignment; remedies for non-performance (right to performance, withholding performance, termination of the contract, price reduction, damages and interest); representation by agents; plurality of debtors and/or creditors; order of priority among assignee and competing claimants; transfer of contract or contractual position; and periods of prescription. The authors take into account the Draft Common Frame of Reference (DCFR), which incorporates the PECL and adds special rules that respond to current needs, notably in the area of consumer protection. The commentary includes extensive reference to case law and legal doctrine at all essential points, providing a comprehensive description of the law in action as well as its evolving trends. The book is a valuable handbook and guide for both foreign and German lawyers. For non-German lawyers, be they practitioners or academics, it provides a concise but complete and up-to-date outline of current German contract law. For German lawyers, it offers a clear insight into a wider European legal contract system whose importance in the evolution of a common European private law is growing rapidly. Chapter 3. Authority of Agents. Chapter 6. Contents and Effects. Chapter 8 . Non-Performance and Remedies in General. Chapter 9. Particular Remedies for Non-Performance. Chapter 10. Plurality of Parties. Chapter 11. Assignment of Claims. Chapter 12. Substitution of New Debtor: Transfer of Contract/Transfer of Contractual Position. Chapter 13. Set-off. 14. Prescription. Chapter 17. Capitalisation of Interest.